LIKE A GOOD NEIGHBOR FOR 98 YEARS! In 1921 the recently-formed Humboldt Stockmen’s Association decided that their annual picnic in Fortuna would include a rodeo to provide entertainment for the stockmen and their families. 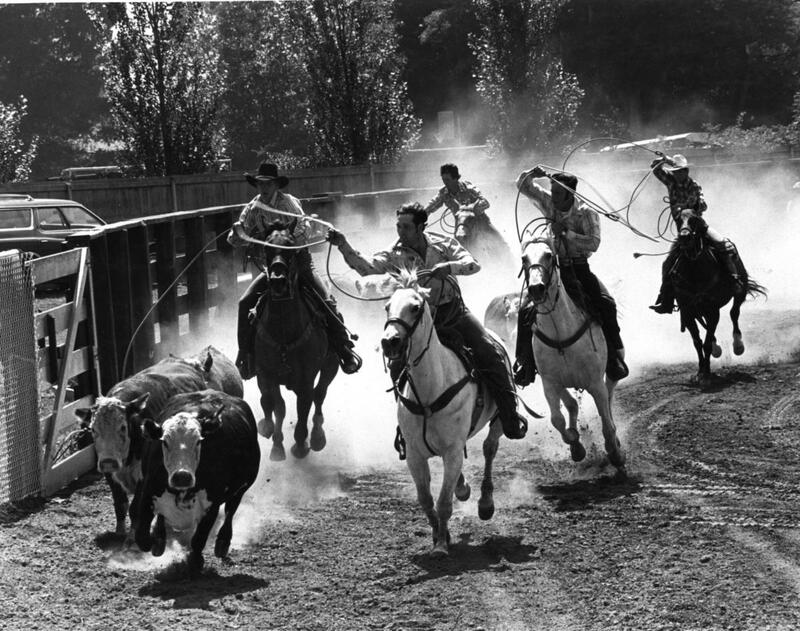 From this beginning, the Fortuna Rodeo has grown and changed with the times, but remains the focal point for summer entertainment in the Eel River Valley. The roots of the rodeo lie in both the stockmen’s history of raising cattle to feed the various timber company crews and in the everyday form of transportation by horse that was gradually being replaced by automobiles. The rodeo also harkened back to a romanticized version of the old west that was being promoted in wild west shows by entertainers like Buffalo Bill Cody. Cattle-based industries have a rich history in Humboldt County. One of the first cattle drives in Humboldt was in 1852 when Joseph Russ brought a herd to Bear River Ridge where he started his ranch. The cattle were destined to feed the many lumber company crews in the county. The rich delta farmlands of the valley also led to the formation of many dairies. In 1915 the Humboldt Stockmen’s Association was formed to help improve the quality of stock raised by the ranchers. Further goals of the association were to provide protection for their animals and prevent stock being stolen. The Stockmen’s Association became very popular, and 300 people attended their picnic and rodeo in 1921. Some of the association’s charter members were Tim Barry, Henry Devoy, Fred Hinkley, Stanley Hunt, Dr. J.W. Logan, Ted Lytle, Jack McClelland, Harry McWhorter, Charles Moore, Doug Prior, Rupert Porter, Joe Russ, William Russ, Fred Smith, Ben Snodgrass, Glen Timmons and Jack Tamboury. The 1921 picnic and rodeo was not the first rodeo-type event held in the valley. In 1912 Jess Stahl, an African American from Ferndale, held a rough riding demonstration at the Rohnerville Fairgrounds, riding “outlaw” horses famed for being difficult to ride. Stahl was destined to become recognized in the Cowboy Hall of Fame for his exploits as bronco rider and rodeo participant. 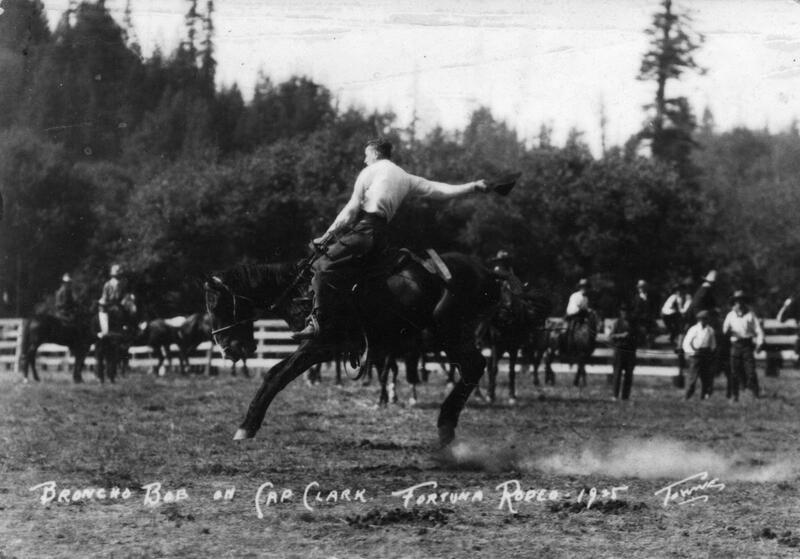 At the 1919 Humboldt County Fair, the Oakland Tribune reported “Seaman John Kelly of the destroyer Boggs carried off the honors of the wild west show of the Humboldt County Fair here by riding an outlaw bronco to a standstill.” During the 1910s several “rough riding festivals” were held in the valley. Most people during that time used horses for transportation and appreciated the skill necessary to ride an untamed horse. None of these events were held annually, and it was not until the Stockmen’s event of 1921 that a formal rodeo was held in Humboldt County. Rodeos were becoming popular in California in the late 1910s, with events being held in Salinas beginning in 1911 and in Hayward, Willits and Red Bluff in 1921. The Fortuna event quickly became popular both on the rodeo circuit and with local residents. Many planned to come to Fortuna to see the parade and the rodeo and to dance. By 1925 the rodeo had become a three-day event, with dancing Friday and Saturday nights. In addition to the regular rodeo events, there was horse racing on the newly-built racetrack around the arena. It was also a “must” for politicians of the era to stop by the rodeo to visit with their constituents. 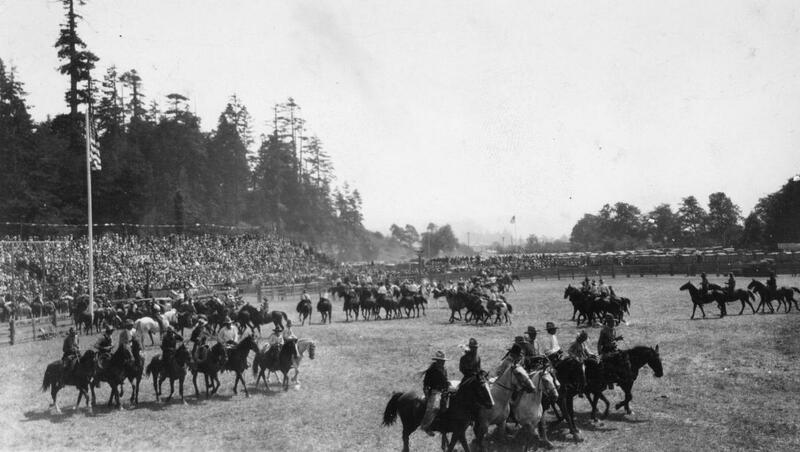 The Redwood Rodeo, as it became known, was only one of the attractions of that weekend. The parade became a part of the rodeo by 1927, when it was billed as a “historical pioneer pageant.” One of the parade participants that year was William Sofer, dressed as a Spanish Californian padre driving an old-time ox team. The organizers of the rodeo have always kept in mind that the rodeo is both a participant and a spectator event. One of the attractions of the 1938 rodeo was two-year-old “Baby Lee Persico and his pony Buck.” The two put on a riding demonstration that was very popular with the audience. 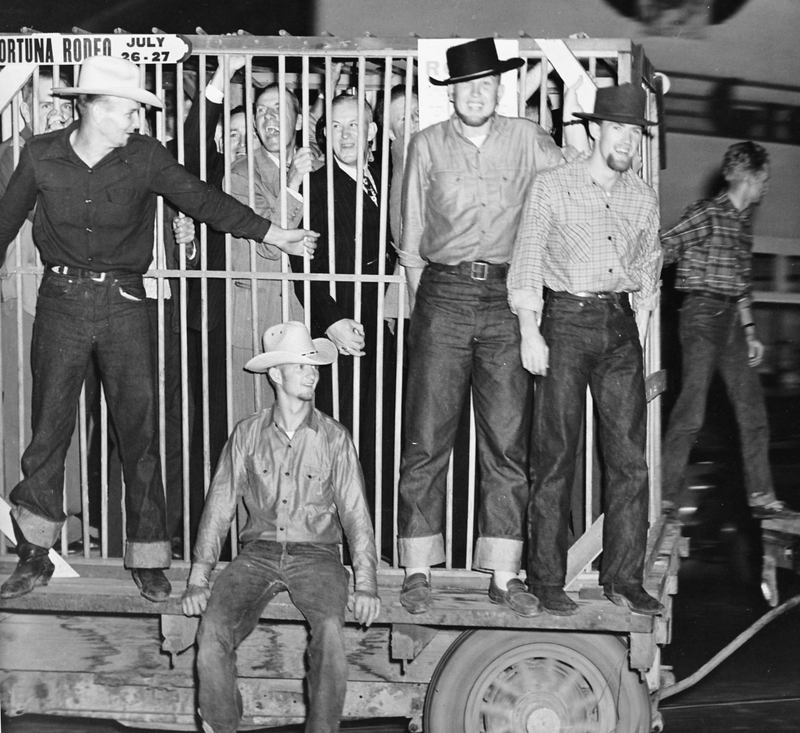 During World War II, the rodeo was not held from 1942—45. The rodeo resumed in 1946, with more than $3400 in prize money for the contestants. The rodeo events were limited to two days, a tradition that has continued. The 1940s also saw the creation of a Rodeo Queen. In 1948, for example, the Rodeo Queen was Stella James, outfitted in western attire courtesy of the Rodeo Directors. The 1950s saw additions to the festivities in the form of a pancake breakfast as well as the carnival. 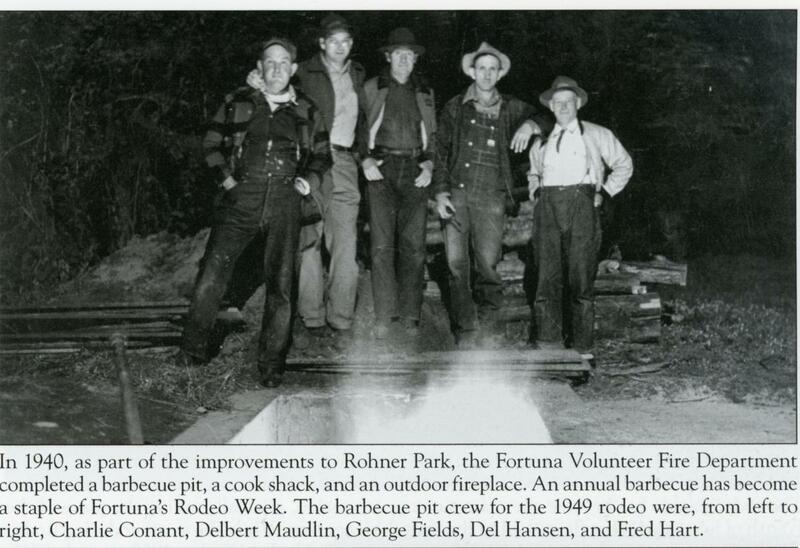 A pit barbeque dinner also became part of the event in the 1950s. Over the decades other highlights such as the firemen’s events, chili cook-off and quad riders have been added. The core of the event remains the celebration of the old west, our local history, and Fortuna. With the parade, dances, pancake breakfasts and barbeques, the rodeo has become a celebration of Fortuna and the people who live here. 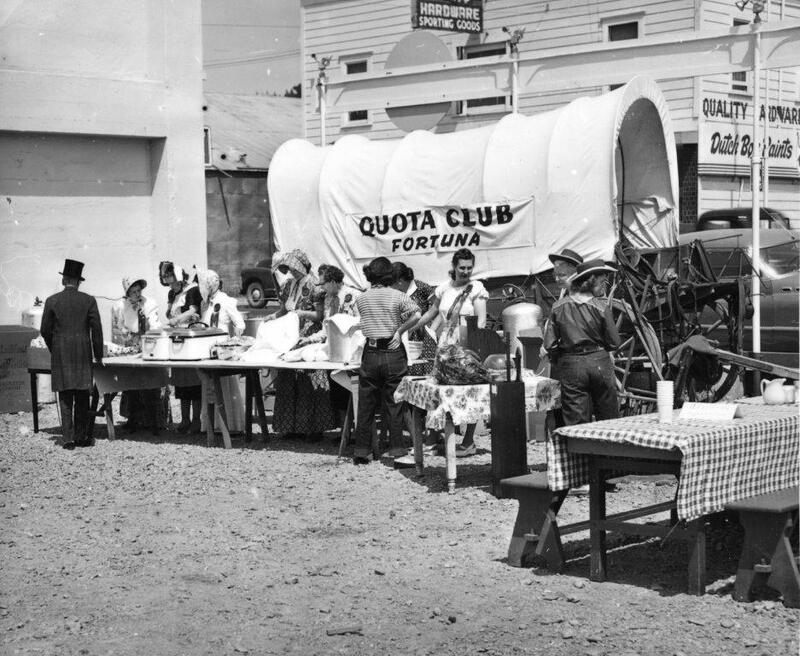 The Stockmen’s Association continued to host the event until the late 1920s, when the rodeo was organized and operated by the Fortuna Chamber of Commerce and the Fortuna Fire Department. The Rodeo Association was formed in 1952. Today the Fortuna Rodeo continues its legacy as a beloved annual celebration that gives back to its community. See the full list of Fortuna Rodeo Sponsors HERE! Site © 2018 FORTUNA RODEO ASSOCIATION. Site powered by PRECISION INTERMEDIA. Photos by CAROL NILES PHOTOGRAPHY and PRECISION INTERMEDIA. Content from this site may not be reused without permission.